Very small dogs have unique physiological traits, such as jaw size, bone strength and sensitive digestive systems, which can benefit from specialized nutrition. 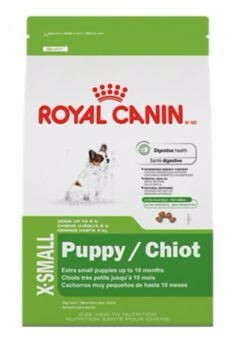 Royal Canin X-Small is a full line of formulas designed to meet the particular needs of your tiny dog at every life stage. X-Small Puppy is for extra small puppies (adult weight up to 8lb) up to 10 months. Features an extra small kibble designed for the miniature jaw of dogs less than 8 pounds. Exclusive, highly palatable formula satisfies the fussy appetites of very small dogs. Brewers rice, chicken meal, chicken fat, corn gluten meal, corn, wheat gluten, natural flavors, dried plain beet pulp, vegetable oil, ground psyllium seed husk, sodium silico aluminate, fish oil, potassium chloride, fructooligosaccharides, sodium tripolyphosphate, DL-methionine, hydrolyzed yeast, choline chloride, monosodium phosphate, salt, taurine, L-lysine, vitamins [DL-alpha tocopherol acetate (source of vitamin E), L-ascorbyl-2-polyphosphate (source of vitamin C), biotin, D-calcium pantothenate, pyridoxine hydrochloride (vitamin B6), vitamin A acetate, niacin supplement, thiamine mononitrate (vitamin B1),riboflavin supplement, folic acid, vitamin B12 supplement, vitamin D3 supplement], marigold extract (Tagetes erecta L.), trace minerals (zinc oxide, zinc proteinate, ferrous sulfate, manganese proteinate, copper sulfate, copper proteinate, manganous oxide, calcium iodate, sodium selenite), L-carnitine, rosemary extract, preserved with mixed tocopherols and citric acid.